Whisk VH® Soya Sauce, garlic, ginger, honey, sesame oil and vinegar in a medium bowl. Transfer to a large re-sealable plastic bag; add flank steak. Marinate, at room temperature, for 15 minutes. Preheat grill to medium; grease well. 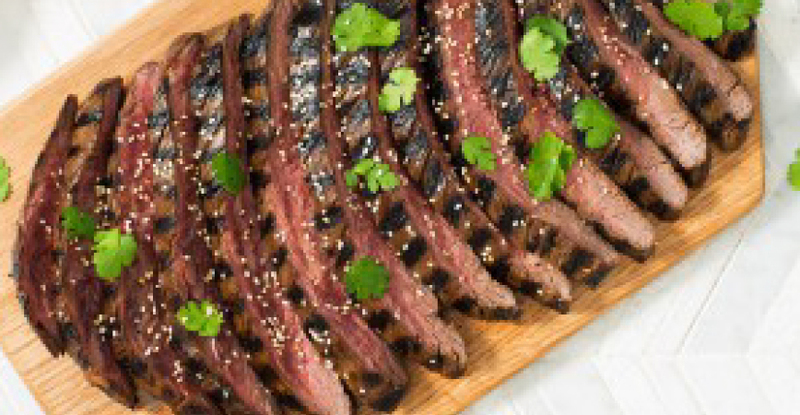 Remove flank steak from marinade and pat dry. Grill, turning once, for 8 to 10 minutes or until browned and internal temperature registers 145oF. Slice and serve sprinkled with cilantro and sesame seeds. For a spicy version, add 2 tbsp sriracha to marinade. Add a splash to homemade meat sauce to kick up the flavor. Drizzle it into mushroom risotto. Stir it into soups and stews to season.